You may want to consider onsite storage while your home is being constructed. It is simple to transfer your belongings into a storage tank or trailer, and they are easy to get at if you should need specific items. On the flip side, security may be an issue – many individuals will be coming and going from your property during this project, and some may not have your best interests in mind. There is also the issue of the lack of temperature controls if the weather should get very humid, hot, or cold. If you plan on building a detached garage, a pool house, and a storage building when you construct your new home, you may want to create one or more of these buildings first. 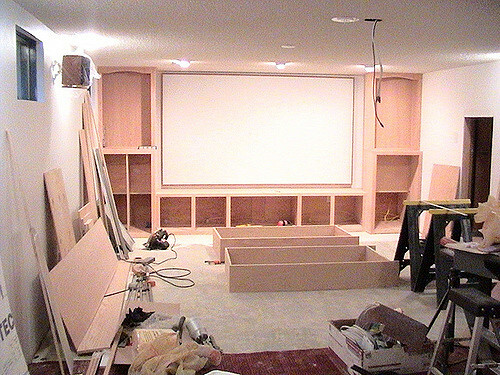 Then you can utilize the structures to store your household furnishings and other articles. Be aware though that you will run into the same issues of security and temperature controls that you would with a portable onsite storage unit. When moving your belongings to an alternate location, it is often wise to employ movers who are highly skilled. This will prevent damage to your home, especially your walls and stairwells, and keep your belongings in optimal condition. You will be able to move back in your new house using the same professionals and have all of your furnishings and other items in pristine condition. Check with your insurance company as to the coverage you can get on your belongings while they are not in your home. Investigate the scope of your homeowner’s insurance to see if it covers household belongings while in storage. If not, be sure to research quality, reasonably-priced protection for your stored items. The very best method of protecting your belongings while you wait for your home to be built is to rent a storage unit that will hold all of your furnishings and household items. You can arrange and organize the contents in a way in which you can get at needed items quickly and easily. You will have 24-hour access and know that they are safe from theft and fire. Temperature-controlled units are also available. Renting storage that will be the perfect size for your belongs is a simple and efficient manner of caring for your essential belongings. Taking care of your possessions will always be a priority for you. You are so looking forward to moving into your new residence and are envisioning how great your belongings will look in the various rooms. Taking one or more of the preceding steps will help you efficiently and quickly do just that.